To be honest, I've never actually used this cheaper, and older, version of the Yashica TLR Line of cameras. It's said to be not as sharp as the 'D' and it definitely shows it's the cheaper version TLR as it does not have as many time settings, does not have thread nor bayonet mount for filters and does only have the basic "red-window" winding system. Well, when the lens is really not too sharp, it means it should be perfect for portraits, you should end up with the nice smooth skintones. Time to try it on one of my portrait assignments. 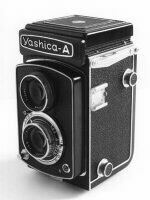 This camera was the cheaper version of the Yashica TLR offerings. Note the limited shutter speeds and the lack of a cable release connector. It's a typical outdoor, sunny weather camera. When your camera came with the ever-ready cover, you might have noticed that you can remove the front part and carry the camera around your neck ready-for-use. Due to the Copal shutter you should be able to use flash at all shutter speeds. According to the manual however Sync speed is 1/60 or slower. Make sure you set the selector right of the lens to the "X" position when using electronic flash. The "M" setting is for flash bulbs and sets of the flash a little earlier than opening the shutter thus allowing for maximum flash-bulb light during lens-open. The lens is less sharp than that of later and more expensive models. Great for portraits though! When the view finder screen appears very dim, you can try to clean the mirror. Be very careful though. Take off the hood by unscrewing the tiny screws. Try not to touch the mirror with your fingers and try not to use any liquid cleaners as you might remove the silver from the mirror. Also try not to take out the mirror as it can easily break. When you want / need to replace the mirror, make sure you'll get glass with the exact same thickness else you'll have to adjust the viewing lens as well. Now that you have the hood off, don't forget to clean the viewing glass as well. 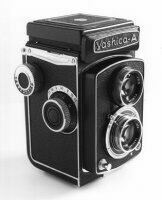 Note that the view finder of the Yashica A appears a lot dimmer than that of the Yashica D.
Using a lens hood with your Yashica is a must.  Not using one often results in lower contrast pictures. Best is to look for a Bay-1 Hood such as the older Rolleiflex type Bayonet. Filters and Close-Up lenses can also be used, just make sure you'll get a Bay-1 version. Since there is no thread around the lens to use a screw-in type lens hood, you can try to use an older screw-on type or one with a clamp mechanism.